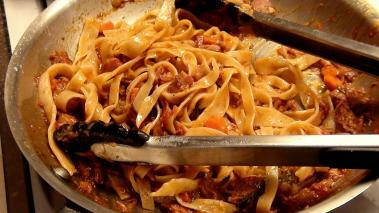 Fettucini and Pork Sugo is one of my favorite pasta dishes. I tend to make large batches of the pork sugo and store it in the freezer. In this video, I’ll pulled some out and use it to dress some Fettucini. I think this sauce goes awesome with long strand wide pastas like this. You can either make your own, or obviously buy some fresh or dried pasta. Once you get your sauce done, the only thing you really need to watch out for is over cooking the pasta. You want to make sure you get a nice al dente texture; I generally go about a minute less than the package says. You also want to make sure you don’t over dress the pasta and have it swimming in sauce - you’ve got to have a nice balance between the sauce and the pasta.